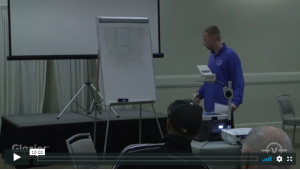 This video was filmed at the PGC/Glazier Spring 2016 Chicago Clinic. When you help ballside, he is talking about Bobby Knight’s “shallow triangle” principle so you can see man and ball. His second comment is an example of things sound good in theory until you put them into practice. The length of the pass to the corner is roughly equal to the length of the defensive slide for the weakside defender. He can’t outrun the ball. He will never get there in time to stop the wide open look.